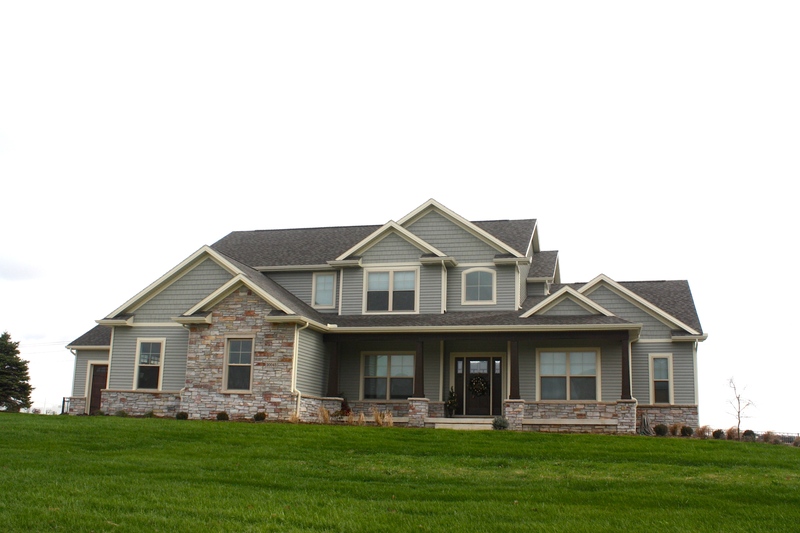 carlsonexteriors – Page 2 – Carlson Exteriors Inc.
One of America’s Fastest-Growing, Private Companies! A couple weeks ago, Inc 5000 named the fastest-growing, private companies in America. Carlson Exteriors was thrilled to be recognized as one of the 5000! Inc 5000 prides themselves on examining entrepreneurs every year to gauge the development. The look at rate and total revenue to rank companies. We are so excited to be included for the second time in a row on the Qualified Remodeler’s Top 500 National List. We are the only Bloomington/Normal contractor to make the list! If you are unfamiliar with the QR 500, they benchmark growth amongst remodeling companies. They use third party verification to ensure the companies that make the list deserve it. David Brenner is this month’s employee of the Month! He works hard to keep the roofing crew on schedule and our customers happy. If you see him- Tell him thank you! Project Manager Nick Coyle has been in the roofing industry practically his whole life. He currently manages the roofing crews, meets with homeowners to provide estimates on roof replacements, roof repairs, and stop tricky roof leaks. I sat down with Nick to find out the most popular questions from homeowners but more importantly the questions homeowners should be asking before hiring a roofer. Nick said this is almost every homeowner’s first question. Most roofers say yes but many homeowners fail to ask for proof. A quality roofer should proudly display this documentation and make it easy for a homeowner to verify. Nick leaves a copy of Carlson Exteriors Inc Roofing License and current insurance with the homeowners that he meets with. Do I have storm damage? The best any roofer can do is to give his professional opinion. Nick takes photos when he is inspects roofs to bring down and explain what he sees to homeowners. Nick can provide his opinion whether the roof looks storm, wind, or hail damaged but ultimately the decision lies with your insurance company. When homeowners contact insurance about potential storm damage, they start a claim which has the potential to raise your rates. Nick advises homeowners to familiarize themselves with their current plan, know their deductible, and to see if it’s worth potentially having higher rates. Example- If it’s a small repair that barely exceeds a homeowner’s deductible; it might not be worth making a claim. Hail damage shows up as pock-marks. What’s the difference between synthetic felt and regular felt? Synthetic felt has grown with popularity amongst roofing companies. It’s easier/safer for crews to walk on and it has a higher resistance to ripping in the wind. Regular 15lb or 30lb felt rips very easy in the hands, while synthetic felt is practically impossible to rip. Some shingle manufacturers require synthetic felt to qualify for warranties. Carlson Exteriors only uses synthetic felt. Click here to read more about synthetic felt. What’s the difference between the Landmark shingles and the Landmark Pro Shingle? This question usually comes after Nick presents the estimate to homeowners. Landmark is the standard shingle and Landmark Pro is a slight upgrade. Both are manufactured by CertainTeed and both qualify for the Unconditional Roof Warranty. Aesthetically, Landmark Pros have a wider selection of color choices and the shingles are Max Def. Max Def means the lights are lighter and the darks are darker giving each shingle a higher contrast. Landmark Pros have a 15 year algae warranty to protect your roof from getting streaky. Nick advices homeowners with many mature trees to select the Landmark Pros because of the 15 year algae warranty. Landmark Pros can have a higher wind rating than the Landmarks; this is dependent upon your contractor. Landmarks and Landmark Pros both can meet the max wind rating of 130 mph if shingle starter is also applied up the roof rakes. Carlson Exteriors uses starter up the rakes to ensure max protection for every homeowner. Ridge vent vs Box vents – Is one better than the other? 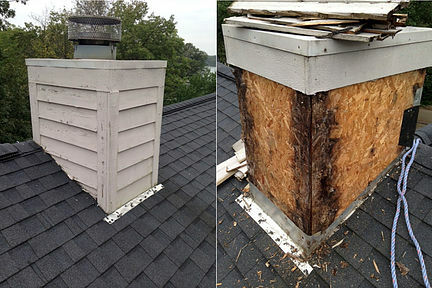 As long as the roof is adequately vented ridge vents and box vents are equal. Currently the trend is to go with ridge vents because it provides a cleaner look on the roof. Nick advises homeowners who are thinking about putting the house on the market to select ridge vent because of the current housing trend. When replacing the roof, there is no price difference between using box vents or ridge vents. Every roof Carlson Exteriors replaces, Nick does an inspection to make sure it has enough ventilation. If a home does not have much ridge line, Nick advises box vents. Can you be more detailed about the products you are using, how you use them, and why you use them? All of this falls into gauging a roofer’s professionalism. If a contractor just provides a homeowner with a slip of paper with the cost it’s essentially the same as someone expecting to sell a used vehicle on craigslist with no listed mileage, information on condition quality, and not allowing a test drive. 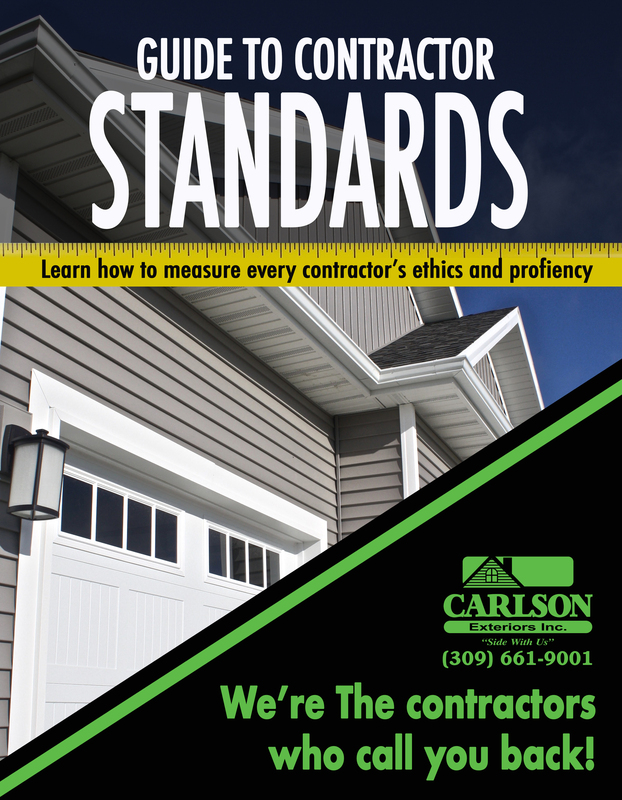 Click here to read more about gauging contractor professionalism. Upon comparing two estimates that are $500-1000 different, what am I getting or not getting? So many homeowners think all roof quotes are created equal and the cheapest is best. Nothing could be furthest from the truth. The easiest way to find out why the cost difference is to call the more expensive roofer and see what they are providing above and beyond the lower estimate. Usually it is because of a better warranty, higher quality products, not re-using certain products (drip edge, flashing, etc), better reputation, better customer service, or more stable company. More stable companies have an office and don’t work out of their house, they have office hours where customers can walk in. Stable companies pay their employees with checks and not cash. Nick concluded our conversation by saying he wished homeowners did more research on roofers and the owners of the company. Information, good or bad, is so easily found online; it’s ashamed that many homeowners don’t utilize this resource. He recommended homeowners to read “How To Find a Contractor You Can’t Live Without” and “Why does a 30 year shingle not last for 30 years?” to better educate themselves on products and finding contractors. If you are in need of a professional opinion of your roof, need a roof replacement, or have a roof leak and want Nick Coyle to inspect – Contact Carlson Exteriors. Unfortunately, the construction industry is abound with poor principle. How do you begin to find a contractor that’s trustworthy? I suggest thinking of contractors as employees you are interviewing to potentially work for you/your company. It may seem silly at first, but that mindset will give you the confidence you need to feel like you can ask the right questions. To find a contractor with good character, you start with their references. We recommend looking into 3 references. owner’s personal finances. The example bank letter has been marked with what to look for. Make sure the letter is addresses to the company (not the owner). It reenforces that the company has it’s own account. Look for some clues to how long the financial institution has known your potential contractor. The longer the better. Having a company that has decent cash flow actually ensures the company has higher skilled employees. If a company needs your job to pay employees for last week’s work, good employees won’t stick around at a company that may or may not pay. If a company asks for half upfront, that money may be used to pay employees or to buy materials for your job because there isn’t enough money in the account to buy materials without your deposit. That’s not a good sign of a good company. Getting a letter from your potential contractor’s supplier ensures they have a great business relationship. This letter lets you know the contractor pays their bills. The last thing you want is a lean placed on your home because your contractor did not pay their material bills. Yes that does happen! Did they arrive on time to perform the work? How was the daily clean up? Did you run into any issues? How did the contractor handle those issues? Were the employees polite and professional? Any specific interactions? Did your neighbors like the crews while they worked on your house? It’s no surprise that Brian Peavler is July’s Employee of the Month. He’s worked 6 days out of the week for the past 3 weeks to help stay on top of the jobs that have lined up. He stays positive and efficient. If you see him out and about, give him a pat on the back! Estimates can be a true testament to a contractor’s professionalism and trustworthiness. Using the detailed estimate as a contract protects you (the homeowner) and protects the hired contractor. All prospective contractors should provide a detailed description of work to be completed; presented in a professional format – not handwritten on note paper or texted. This estimate should be very specific about what products are being used (including name brands) and what products might be reused (if applicable). After agreeing upon price, you should expect no surprise charges from the contractor. Below we examine why using an estimate as a contract, a legally binding agreement, protects everyone involved in a remodeling project, roof replacement, or even a small repair. I know this sounds obvious, but so many homeowners find themselves paying more because they assumed certain construction related tasks would be included. The estimate you receive should include any type of removal. For roof replacements where the contractor is tearing off the old shingles, the contractor should list that and how many layers of asphalt to get down to wooden deck. On new siding estimates, your contractor should list if they are taking off the existing siding, or just covering over the existing. If covering over existing, they should be specific in what measures are being taken. Are they fan folding over? If it’s over cedar siding, what will be done if certain areas of the cedar are rotted. You should expect brand names of products to be listed. When the work is being performed, you should make sure those brands are actually being used- if not, that will be a breech of contract. Unfortunately, there are many companies out there trying to cut corners by not using the brand-names they promise. Some construction companies expect homeowners to provide a dumpster. Personally, I think that’s rude and unprofessional. Make sure the estimate lists whose responsibility it is to clean up, order/pay for the dumpster, and any other type of debris removal. The estimate you are given should be the final number. No extra surprises! No hidden costs! By using your original estimate as a contract it ensures that the detailed work listed above will not include any additional fees. This protects the homeowners. It also protects the contractor by having the expected work detailed out. It states clearly what they intend to do and at what cost. If the homeowner adds anything to the scope of work along the way, the contractor can revise estimate to include the added work and clearly state the added cost. In construction, you can’t always tell what’s going on beneath the surface. Most contractors can looks for clues of rotting or mold lying beneath the surface but sometimes you can’t tell until it’s exposed. All estimates should include a proposed rate at replacing OSB or any type of underlayment. If the homeowner has any responsibilities, it should also be clearly listed on the estimate. Some homeowners have siding panels on reserve in case they need a siding panel replaced. Just by supplying the material to repair panel of siding, that responsibility should be listed. In summation, the estimate should clearly state anything “assumed” on both sides. Homeowners and Contractors should clearly understand what’s being expected of them and at what expense. This is the mark of a true professional contractor. In April, we happily received this letter stating that we were ranked the 16th roofer in the nation and the 2nd roofer in the State of Illinois in registering roof warranties. So many roofing companies out there promise warranties they cannot deliver. Carlson Exteriors is not one of those. For every roof we install, we register it in the homeowner’s name(s) with CertainTeed, a leading shingle manufacturer. We actually pay for this warranty but pass it on to our customers for free. Why? Because purchasing a roof with a solid warranties, no loop holes and no prorating, should be demanded from by homeowners. Jan needs a new roof. Her neighbor Stan also needs a new roof. Both Jan and Stan call 3 roofers to compare estimates. Jan decides she wants to go with Carlson Exteriors because of the Sure Start Roof Warranty. Stan decided to go with Chuck in a Truck Roofing Company because they were the cheapest. Jan and Stan have similar roofs and are both getting CertainTeed Landmarks (shingle); Jan paid $10,000 and Stan paid $9,000. Jan gets the roof registered in her name with a certificate as proof. Stan gets the standard Limited Warranty on the shingles. In 11 years, both Jan and Stan realize that their shingles are curling on the edges like potato chips. The asphalt shingles are very brittle. The roof is failing not because of how the shingles were installed or because of any hailstorms; the shingles just malfunctioned. Roofers come out and say it will now cost $12,434 to replace the roof. Even though nothing has changed to the roof, inflation has raised the cost of the roof replacement. Jan’s annoyed but not worried because she has her 4-Star warranty. Stan is mad but knows he has some kind of warranty. Jan places a claim with CertainTeed, they issue her $12,434 to have the roof replaced. This includes the tear-off of the bad shingles, dumpster fees, permit fees, roofing labor, and new shingles. Jan is happy. Stan places a claim with CertainTeed, they explain that since he only has the Limited Warranty they cannot fully cover the roof replacement; they issue Stan $3,233. Stan is responsible for the other $9,201. Stan is mad that his “50 year shingle” only lasted him 11 years. All of Carlson Exterior’s roof replacement customers are Jan. They get this 4-star Warranty register in their names. They don’t have to worry if their shingle will last 50 years, because if it doesn’t – CertainTeed will cover them. 2017 was the year of some monumental home transformations. Let’s re-cap a couple show stoppers! A lucky home in Bloomington, IL went from real wood shakes on the roof to a maintenance- free synthetic wood shaker shingle. Along with the faux wood roof, they added in real copper flashings and window pans. Next transformation goes to a county ranch. The homeowners wanted to freshen up the look by replacing real cedar siding with English Wedgewood Blue vinyl siding. This lovely colonial style home wanted to be the talk of the street by going from a neutral color siding to a striking dark grey siding with contrasting white trim. They also traded the shutters for wider window casings; modernizing it slightly. The last feature home from 2017 enriched their home by exchanging the discolored tan siding for a darker brown. The also traded in their shutters for window casings. The half moon windows on the side of the home were covered up.